Torkil Lauesen has been an anti-imperialist activist and writer since the late 1960s. His publications in English include “It’s All About Politics,” as well as an interview with him—both of which can be found in Turning Money into Rebellion, edited by Gabriel Kuhn (PM Press, 2014). Zak Cope is the author of Divided World Divided Class: Global Political Economy and the Stratification of Labour under Capitalism (Montréal, Canada: Kersplebedeb, 2012 and 2015) and co-editor, with Immanuel Ness, of the Palgrave Encyclopedia of Imperialism and Anti-Imperialism (Palgrave Macmillan, forthcoming in fall 2015). In this article, we aim to demonstrate that the low prices of goods produced in the global South and the attendant modest contribution of its exports to the Gross Domestic Product of the North conceals the real dependence of the latter’s economies on low-waged Southern labor. We argue that the relocation of industry to the global South in the past three decades has resulted in a massive increase of transferred value to the North. The principal mechanisms for this transfer are the repatriation of surplus value by means of foreign direct investment, the unequal exchange of products embodying different quantities of value, and extortion through debt servicing. The incorporation of huge Southern economies into a capitalist world system dominated by global North-based transnational corporations and financial institutions has established the former as socially disarticulated export dependencies. The miserably low wage rates within these economies is predicated upon (1) the pressure imposed by their exports having to compete for limited shares of the largely metropolitan consumer market; (2) the drain of value and natural resources that might otherwise be used to build up the productive forces of the national economy; (3) the unresolved land question creating an oversupply of labor; (4) repressive comprador governments, who benefit from and accept the neoliberal order and are therefore unable and unwilling to grant wage rises for fear of spurring workers’ demands for greater political power; and (5) militarized borders preventing the movement of workers to the global North and, hence, an equalization of returns to labor. The debate on value transfer and unequal exchange is not new. Today, however, an increasingly large proportion of the goods the world consumes are produced in the global South. Production is not, as in the 1970s, limited to primary and simple industrial goods like oil, minerals, coffee, and toys. Rather, despite relatively low manufacturing “value added” (of which more below), virtually all types of industrial inputs and outputs are produced in the global South: these include chemicals, fabricated metal goods, machinery and electrical machinery, electronics, furniture and transport equipment to textiles, shoes, clothes, tobacco, and fuels.1 But why, and how, has this shift in the location of production happened? The change in the international division of labor is a product of capitals’ perennial quest for higher profits and is based, first, on enormous growth in the number of proletarians integrated into the capitalist world system and, second, on the substantive industrialization of the South over the past three decades. This was made possible by the dissolution of the Soviet and Eastern European “actually existing socialist” economies, the opening of China to global capitalism, and the outsourcing of production to India, Indonesia, Vietnam, Brazil, Mexico, and other newly industrializing countries. The result was an increase of at least one billion low-wage proletarians within global capitalism. Today over 80 percent of the industrial workers in the world are located in the global South, while the proportion falls steadily in the North (see Chart 1). We may be living in post-industrial societies in the North, but the world as a whole is more industrial than ever. Sources: John Smith, “Imperialism and the Law of Value,” Global Discourse 2, no. 1 (2011): 20, https://globaldiscourse.files.wordpress.com. The 2010 industrial workforce data was extrapolated from 2008 sectoral distribution of workforce in the International Labor Organization’s (ILO) Key Indicators of the Labor Market (KILM), 6th edition (ILO, 2010); Economically Active Population (EAP) from the ILO’s Laborsta database, http://laborsta.ilo.org/default.html; and projection of “more developed regions” industrial workforce includes the ILO estimate of recession-induced decline. 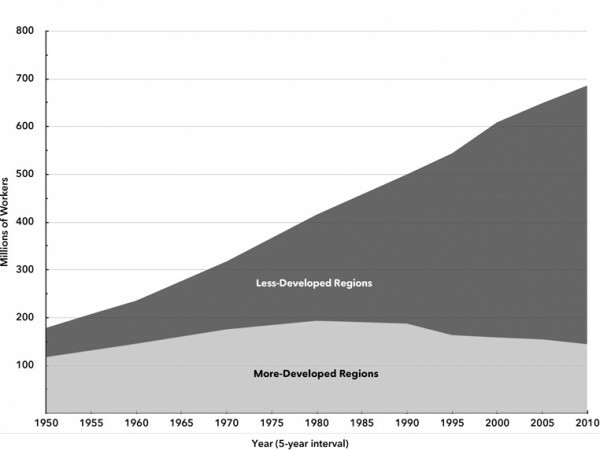 The ILO categories “More” and “Less” developed regions roughly correspond to the contemporary categories “Developed” and “Developing” economies, respectively. The industrialization of the South was not anticipated by the dependency theory of the 1960s and ’70s. It held that the capitalist center must block any advanced industrial development in the so-called periphery, so that it remains a supplier of raw materials, tropical agricultural products, and labor-intensive simple industrial production, which is to be exchanged for the advanced industrial products of the center. Few analysts had foreseen the industrialization of the South as driven by trade with and investment by metropolitan capitalism. However, the South’s industrialization came to provide a (temporary) solution to capitalism’s economic and political malaise in the 1970s, manifested on one side by a declining rate of profit, the oil crisis, and pressure from the labor movement in the North for ever-higher wages and, on the other, by the national liberation struggles of the South. Yet the South’s industrialization was not a concession to its demands; quite the contrary. Rather than a step towards a more equal world, it has resulted in a deepening of imperialist relations on a global scale. This new imperialist political economy rests on two foundations. First, the development of new productive forces in electronics, communications, transport, logistics, and management: computers, the Internet, mobile telephones, container transport, and the development of globalized production chains with newly minted management regimes. Second, the development of neoliberalism with the removal of national barriers for the movement of capital and goods, the privatization of public and commons spheres, the establishment of new global institutions such as the World Trade Organization (WTO), G-meetings, and other forms of global political management, and new military strategies aimed at containing and rolling back the spread of national and socialist developmentalism. In this new accumulation regime, it is not only capital and trade in finished goods which have become transnational; production itself has become globalized in value chains. The sub-processes in the production chain are located in those places where the cost of production, infrastructure, and tax laws are optimal for capital. A car or a computer is produced using inputs and components from hundreds of firms, located in many countries, and the product may be assembled in different parts of the world. Neoliberalism has brought about a new global division of labor in which the global South has become “the workshop of the world.” Global capitalism increasingly polarizes the world into Southern “production economies” and Northern “consumption economies.” The main driver behind this process is unquestionably the low wage level in the South. As such, the structure of today’s global economy has been profoundly shaped by the allocation of labor to industrial sectors according to differential rates of exploitation internationally. 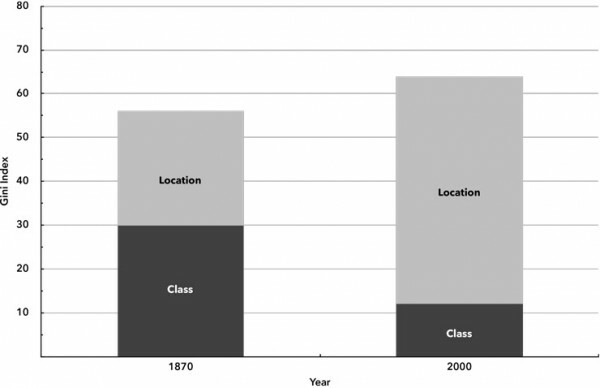 According to World Bank economist Branko Milanović (see Chart 2), in 1870 global inequality between world citizens was considerably less than it is today. More strikingly still, from being predominantly driven by class (that is, in Milanović‘s non-Marxist conception, the share of national income), inequality today is driven almost entirely by location, the latter contributing 80 percent of global inequality. Thus, he writes, “it is much more important, globally speaking, whether you are lucky enough to be born in a rich country than whether the income class to which you belong in a rich country is high, medium or low.”4 What is not said is that the geography of inequality is the product of the economic, legal, military, and political structures of past colonialism and latter-day neocolonialism. These historical factors form the basis for the class struggle that determines what Marx referred to as the “historical and moral” aspect of wage levels. Sources: Branko Milanović, The Haves and Have-Nots: A Brief and Idiosyncratic History of Global Inequality (New York: Basic Books, 2011), 112; Francois Bourguignon and Christian Morrison, “The Size Distribution of Income Among World Citizens, 1820–1990,” American Economic Review 92, no. 4 (September 2002): 724–44; Branko Milanović, Worlds Apart: Measuring International and Global Inequality (Princeton: Princeton University Press, 2005), fig. II.3. The low level of wages in the South creates not just a higher global rate of profit than would otherwise be obtained; it also affects the price of goods produced in the South. In mainstream economics, the formation of the market prices for a personal computer through the production chain could be described as a “smiling curve” for “value” (sic) added (see Chart 3).5 “Value added”—which in mainstream theory is simply equivalent to the new added income measured in conventional price terms—is high in the first part of the chain, with highly paid research and development, design, and financial management located in the North, whereas the curve falls in the middle, with low-wage labor in the South producing the physical product. Value added/price rises again towards the end of the curve with branding, marketing, and sales taking place in the North, despite wages for retail workers being amongst the lowest in those countries. In the logic of the “smiling curve,” the main part of the value of the product is added in the North, while the labor in the South, which manufactures the goods, contributes only a minimal portion thereof. According to this view, multinational corporations perform a public service by reducing the price of consumer goods. In truth, however, low market prices for such goods conceal the fact that workers have to live in miserable conditions due to the low wages and grueling working conditions in the Southern part of the production chains. In Marxist terms, by contrast, value is the sum of direct and indirect socially necessary labor time that has gone into producing a commodity (in the form of currently performed or “living labor” and capital or “dead labor,” respectively). Although, as we will see, the market price of a commodity regularly diverges from its value, it is ultimately determined by value. Thus if one were to draw the curve for the Marxist concept of value added, in a production chain for computers, it would take more or less the opposite form of the smile curve—a kind of “sour smiley” (see Chart 3). But if there is a correlation between value in the Marxist sense and the market price, how does this transformation from the sour smiley of value to the happy smiley of market price take place? Irrespective of other differences between economic theories, they tend to agree that the price of production of a commodity is equal to the price of the material inputs plus the remuneration of those who are bestowed with a claim on a part of the value of said production. This second part is subdivided into the part accruing to wages and the part accruing to all other claims: profit, rent, interest, etc. But what is the independent variable of the economy that determines prices? In neoclassical economics, the ultimate determinant is “the market,” that is, the subjective needs and preferences of the consumer. These needs and preferences determine the prices of the final goods and these, in turn, determine wage costs and profit levels. Accordingly, prices serve the purpose of measuring demand in the market and arise through exchange between competitive traders. By contrast, Marxist value theory situates the determination of prices on the production side of the economy. The cost of production, or cost price, is the stepping stone in the transition from value to market price. The cost price of a product consists of the costs of “constant” capital (raw materials, machines, buildings, fixed plant, etc.) and “variable” capital (that is, wages). On top of the cost price, the market price must cover at least the average rate of profit. This is because commodities need to be produced and reproduced continually, and if capitalists do not recover the cost of production plus a profit when they sell, (re)production stops. Therefore, in Marxist economics market price reflects the cost of (re)production. How do we measure the cost of production, that is, the inputs required to produce a commodity? We cannot use prices in general to measure inputs, since prices are what we are trying to explain in the first place. One thing, however, is common to all inputs to a commodity: human labor. All market prices in a capitalist economy are in the final instance tied to the extent of consumption of labor. What Marx called “living labor,” or labor-power, is no ordinary product. Its price—the wage—is determined not only by reproduction costs (its own cost of production: food, housing, education, and so on), but also by political struggles—class struggle—reflecting power relations between classes and groups in society. Thus whilst supply and demand can give the final touch, the basic factor underlying market price is the cost of (re)production, and with it the price of labor-power. The price of production of a specific commodity, however, is not the same as its value, though the aggregate price of all commodities is the same as aggregate value. Workers in different firms paid the same wage rates and working the same hours each day create the same sums of surplus value, that is, the difference between the time the worker spends reproducing their own labor-power and the total time they are employed. As such, we might expect more labor-intensive firms to create the most surplus value and, hence, command the highest rates of profit. The movement of capital between firms and industrial sectors, and the resultant changes in supply and demand, however, ensures that price levels ultimately settle around the point at which the rate of profit is the same in all industries. As capital is withdrawn from industries with low rates of profit and invested in those with higher rates, output (supply) in the former declines and its prices rise above the actual sums of value and surplus value the particular industry produces, and conversely. Thus capitals with different organic compositions (the ratio between constant and variable capital) ultimately sell commodities at average prices and surplus value is distributed more or less uniformly across the branches of production according to the total capital—constant and variable—advanced.7 An average rate of profit is formed by competing capitals’ continuous search for higher profits and the flight of capital to and from those industrial sectors producing commodities in high or low demand. Overall, where one commodity sells for less than its value there is a corresponding sale of another commodity for more than its value. It is through their transformation into market prices that value and surplus value are distributed among capitalists within and between sectors. The uneven distribution of value occurs because of high/low organic and value compositions of capital, rent extracted through both monopoly and monopsony, relative productivity, and the tendency towards equalization of profit rates. It occurs between capital and labor through the respective shares—profits and wages—each receives as a result of prevailing class relations. Crucially, it also occurs between nations because of differences between the national market price of labor capacity (the wage) and the market price of those goods which labor consumes (the wage bundle). This holds true both for national and international economies. However, the price of labor-power—the wage—differs enormously on the global level between North and South. In a world where the market price of goods tends to be global while the market price of labor capacity varies because of class struggle—both historical and contemporary—the result is a redistribution of value from countries with a low market price for labor capacity to countries with a high market price for such. Thus imperialism must be explained in the context of the transformation of value into price. To claim that this shifts the concept of exploitation from the sphere of production to that of circulation, however, is disingenuous. It is human labor that creates value and surplus labor that creates surplus value. However, (surplus) value is not a physical property that labor adds to goods like some kind of molecule incorporated and stored in the product. Rather, value and the transformation of value into market price is the result of social relations between labor and capital and between different capitals. It is the transformation from value to market price that ensures that the accumulation process continues on an expanded scale. This expanded circuit of capital involves the transformation of value and surplus value into profit, and the transfer of value from the South to North according to the low prices paid for goods produced in the former by the latter. Exploitation does not, therefore, occur in one particular sector of production or national economy; it is the result of the total global capital accumulation process. We may now move from these theoretical considerations to a specific example of this dynamic, namely, the globalized production of the ubiquitous Apple iPad. If the iPad were to be assembled in the United States, the wage cost of production would not be $45 but $442. And if we go one step deeper into the production structure of the iPad, into the sub-components and raw materials inputs, we learn that most of these material inputs are also produced in the South with an approximate wage-cost of $35 per iPad. If this production also took place in the United States, its wage cost would be approximately $210. By the time a commodity has gone through numerous nodes of a global chain to arrive at the doorstep of the consumer, it has incorporated not only the inputs of low-paid labor-power but also massive amounts of underpaid and unpaid labor and ecological inputs. Capitalists drain hidden surpluses from household and informal-sector activities. A long dark-value chain of food producers and informal-sector activities is needed to generate the productive capacity and the survival maintenance of every waged laborer. This flow of dark value lowers the reproduction costs of peripheral labor and, thus, the wage level that capitalists pay. These household and informal sectors are not outside capitalism, but are intrinsic components of global commodity chains. Ecological degradation, pollution, and depletion comprise an array of externalities through which Apple suppliers extract dark value. Each iPad uses thirty-three pounds of minerals (some of which are rare and limited in supply), seventy-nine gallons of water, and enough fossil fuel–based electricity to generate sixty-six pounds of carbon dioxide. Moreover, the production of an iPad generates 105 kilograms of greenhouse gas emissions.18 All of these ecological burdens are put on the shoulders of China and other Asian countries, while the product is consumed in the North. Ecological degradation is an externality that is embedded in the iPad as dark value. Looking only at pollution costs, Clelland estimates that Apple escapes the costs of $190 per unit that it would have to pay in the United States for ecological externalities.19 Capitalism is dependent upon, even driven by, all these forms of dark value. These factors never appear in the accounting of production costs; they are invisible “gifts” to capitalists and to buyers. Marx thought that the value of labor-power must decline with the increased productivity of labor, and that where it did not, the tendential fall in the general rate of profit thus occasioned must intensify. Under imperialism and the global system of national oppression established thereby, however, monopoly capital is able to guarantee low cost prices for workers’ consumption goods produced by superexploited labor in the South. Alongside the parallel cheapening of constant capital through low cost intermediate and raw materials goods imports, the sale of inexpensive consumer goods imports to (superwaged) workers in the imperialist countries cheapens the value of labor-power there, thus increasing the level of supposed “surplus value” produced locally. As such, northern workers appear to be more productive in terms of the profits they generate. In terms of “productivity,” however, the principal measure of “productivity” is not “value added” per hour of labor—this depending upon sales prices inflated by monopoly, transfer pricing, unequal exchange, and state, military, and police intervention to repress labor costs overseas—but hourly labor costs relative to profits generated at the global level. This contradiction must eventually manifest itself in anti-capitalist movements towards (and beyond) socialism. In the global South reside those classes with both the objective interest and the capacity to resist global neoliberalism. Similar to the wave of anti-colonial national liberation movements that erupted across the Third World from 1945 to 1975, we foresee the possibility of a new wave of anti-capitalist movements in the coming years. Owing to the central position of the new proletariat in the South, its strength in the global economy is much greater than it was under the wave of national liberation that swept the world in the 1960s and ’70s. However, the political realization of that strength is not at all given. The subjective forces are not in place either in the South or in the North. As such, the task of the global left is huge. In the 1970s, millions struggled and died for socialism. Today those fighting for socialism are comparatively few. Socialism is not a strong “brand.” The division of the globe into South and North is reflected in a division of the global working class, so that a section thereof is provided with enormous economic and political benefits that have helped secure its allegiance to the imperialist status quo. This allegiance is, of course, bolstered by consumers’ acceptance of the propaganda of state and corporate media monopolies. It is one of the most profound problems facing today’s socialist forces globally. To tackle these problems we must first take a global perspective on the struggle so as to match the globalization of capital. Only from this global perspective can we work out effective local strategy and tactics. To try to find lucrative solutions to the present crisis by means of national protectionism (whether of the social-democratic, “green,” or fascist varieties) is not only anti-solidarity, it is also a loser’s strategy—an inevitable race to the bottom. ↩United Nations Industrial Development Organisation (UNIDO), “Table 8.4. Developing and Developed Countries’ Share of Global Manufacturing Value Added by Industry Sector, Selected Years, 1995–2009 (percent),” Industrial Development Report 2011 (New York: United Nations, 2011), http://unido.org, 146; see also “Table 8.7. Share of Manufacturing Employment for Developing and Developed Countries, by Industry Sector, Selected Periods Over 1993–2008 (percent),” 151. ↩Zak Cope, Divided World Divided Class: Global Political Economy and the Stratification of Labor under Capitalism, second edition (Montréal, Quebec: Kersplebedeb, 2015), 378–82. ↩Benjamin Selwyn, “Twenty-First-Century International Political Economy: A Class-Relational Perspective,” European Journal of International Relations (December 3, 2014): 1–25, http://academia.edu. ↩Branko Milanović, The Haves and Have-Nots: A Brief and Idiosyncratic History of Global Inequality (New York: Basic Books, 2011), 113. ↩The smiling curve was first proposed by Stan Shih, the founder of Acer, around 1992. According to Shih’s observation, in the personal computer industry, both ends of the value chain command higher values added to the product than the middle part of the value chain. If this phenomenon is presented in a graph with a Y-axis for value-added and an X-axis for value chain (stage of production), the resulting curve has the shape of a smile. ↩Howard Nicholas, Marx’s Theory of Price and Its Modern Rivals (New York: Palgrave Macmillan, 2011), 30, 39–40. ↩Marx refers variously to the technical composition of capital , the value , or price, composition of capital, and the organic composition of capital . He writes: “I call the value composition of capital, in so far as [emphasis added] it is determined by its technical composition and mirrors the changes of the latter, the organic composition of capital. ” As Paul Zarembka has written, however, the qualifier is a significant one since the value of labor-power (variable capital) “can change with-out any change in the technical composition in circumstances in which workers themselves can receive more or less, while producing with the same technology.” See Paul Zarembka, “Materialized Composition of Capital and its Stability in the United States: Findings Stimulated by Paitaridis and Tsoulfidis (2012),” Review of Radical Political Economics 47, no. 1 (2015): 106–11. For Marx, as capital (dead labor) accumulates and is increasingly employed relative to living labor, the organic composition of capital rises and the rate of profit tends to fall. ↩Henry Grossman, The Law of Accumulation and Breakdown of the Capitalist System (London: Pluto Press, 1992; originally 1929), 170. ↩Howard Nicholas, “Marx’s Theory of International Price and Money; An Interpretation,” in Immanuel Ness and Zak Cope, eds., Palgrave Encyclopaedia of Imperialism and Anti-Imperialism (New York: Palgrave Macmillan, 2015). ↩Kenneth L. Kraemer, Greg Linden, and Jason Dedrick, “Capturing Value in the Global Networks: Apple´s iPad and Phone,” University of California, July 2011, http://pcic.merage.uci.edu. ↩Donald A. Clelland, “The Core of the Apple: Dark Value and Degrees of Monopoly in the Commodity Chains,” Journal of World-Systems Research 20, no. 1 (2014): 82–111. ↩Ibid, 88, with figures drawn from analysis of data in Kenneth Kraemer, Greg Linden, and Jason Dedrick, “Capturing Value in Global Networks,” Personal Computing Industry Center, University of California–Irvine, 2011, http://pcic.merage.uci.edu. ↩Clelland, “The Core of the Apple,” 85. ↩In discussing the findings of the International Labor Organisation Global Wages Report 2014 , Patrick Belser notes: “wage growth in developed economies almost stands at zero, and global wages are growing by 2 percent. If you take China out of the equation, the global wage growth is quite simply cut in half.” See Patrick Belser, “Fiscal Redistribution: Yes, but Inequality Starts in the Labor Market: Findings from the ILO Global Wage Report 2014/2015,” Global Labor Column , 2014, http://column.global-labor-university.org. At this rate of growth, we may generously assume that wage levels in the global South will catch up with those in the global North, where they are at least ten times higher on average, in about 500 years.